Just a quick note and reference to this Nate Silver post in which he examines the Olympic medal trends over the past few decades (away from Europe and towards North America and Asia) and concludes that while a centrally planned economy may be bad for many things it is quite effective for Olympics results. Canada beat us in the medal round of Hockey today. Damn that Obama! Either due to poor organizing (such as it is) or poor reporting, I have no idea what’s going on here. But that dance goes on. Windows were broken, but it looks like the assault on police officers was thankfully limited to plastic bottles and pizza. “We had the old left, we had the new left, and now we have the what’s left.” – Pat Scott of KPFA talking about the Peoples Park protest sequels of the early 1990s. I’m a little burned out on Kos posts these days. Not that they’re dogmatic. They tend to be. It’s forgivable. What isn’t forgivable is predictability. Well, this post is a little different. It starts out predictably enough. By now you’ve hit the link and you know it’s not about Obama, but about Reagan at a similar point in his presidency, with figures much worse and having come in with an economy far less trashed by his predecessor. We all know that the economy sank much lower during the first couple of years of Reagan, after which he pulled us out by…. unprecedented spending. I’ve already discussed military Keynesianism, and the point that no president – not one, has pulled us out of a recession by cutting taxes. Most of us understand. It’s not a new argument. What I love about the post is the final sentence. It must have been quite a luxury for Reagan’s administration to not have a breathless, narrative-driven, fact-allergic, obituary-addicted, lunatic 24-hour cable news cycle during their first term. On the other hand, might a breathless, narrative-driven, fact-allergic, obituary-addicted, lunatic 24-hour cable news cycle have killed Nixon’s administration early enough to avoid a generation of political cynicism? A benefit for the Discovery Museum. Clif Clendenen asked me to join his “Brown Act Team” of himself, Jim Lamport, Mel Kreb, and Don Brown. We all put suits and ties over our wet suits and joined about 100 others to jump into the Humboldt Bay this morning at the F Street dock. There were some great costumes, including a group of young hard bodies in speedos and bikinis, as a wide variety of community folk joined for a good cause. Rex Bohn was the MC. I had no idea he read my blog! Lots of community leaders were present, and some of them even jumped in. Little did I know there was a tsunami warning relating to the Chilean earthquake. The waves haven’t hit Humboldt County yet and they’re only expected to be a foot and a half, but that could have made this morning’s event interesting. I was expecting to be miserable based on yesterday’s storm, but there wasn’t a cloud in the sky this morning. Lots of fun. I’ll plan to do it again next year. It was worth it for the complimentary bloody Mary alone. Oh, and I was interviewed by a Channel 3 reporter. I could be on the news tonight. Addendum: Can’t find any videos of today up on youtube yet, but here’s last year’s parade from the museum to the waterfront. Same feel, only it was sunny today. And here are some of last year’s plunges. Who knew that “Woodstock Hippies” brought down the economy? Thanks to John Rogers for the link. A Maryland teenage student refused to stand for the Pledge of Allegiance and the teacher had her basically arrested for it. On the first day she refused, the teacher sent her to the office (one wonders why the principal didn’t rectify the situation immediately). On the second day the teacher called the school police to have her removed from the classroom as the teacher insulted her and allowed other class members to taunt her. The ACLU is involved and quite frankly I don’t think they should let the district off with just an apology. The district recognizes that she had the right, but there really should be zero tolerance for this. Give the girl credit for her courage, but this teacher’s actions have probably made the duration of the girl’s high school time a living hell. Quite frankly, having this teacher wag his/her finger at the kids he/she has already whipped up is a remedy which will do more to aggravate than mitigate. And personally I think the teacher should be required to attend a high school civics class and pass it. Following yesterday’s boring summit, the White House is pushing Congress to pass the Senate Bill with reconciliation fixes. The Republicans certainly weren’t moved by anything, and they continue to abuse the filibuster, with one Senator blocking the extension of unemployment benefits complaining that he had to miss a basketball game to do it. Meanwhile, according to this poll the public supports the concept of majority rule. Rob Arkley volleys. Heraldo rebuts. Courtesy of Old Glory Radio. As to whom is being satired in each case, your guess is as good as mine. 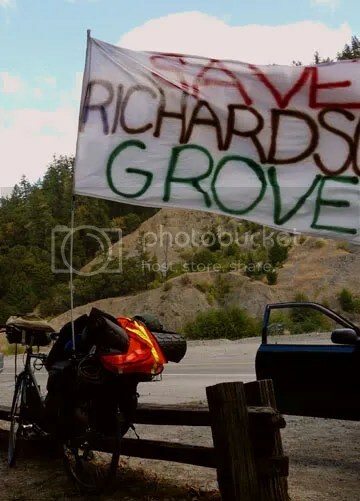 I’m drafting something up about tonight’s Richardson Grove forum. I figured others might want to chime in with thoughts before I finished. By the way, STAA stands for Surface Transportation Assistance Act. I didn’t know that. So the panel convinced me, or would have had I not already been convinced, that the public process has been wholly deficient, and the EIR probably inadequate. Ken Miller made a good case for the argument that the PR has only addressed the micro-issue and not taken a more broad approach to policy in terms of alternative means of getting goods in and out of the county, nor discussing the fact that STAA truck projects are in process up and down the coast. What I’m not convinced of is that the project will have any serious environmental impact, either as far as the trees are concerned, or increased traffic. I certainly don’t believe that the project will turn 101 into another I-5. I remain agnostic as to whether small business or big business would be the primary beneficiaries of the larger trucks and associated reduction of costs due to offloading. Someone asked whether small businesses might actually acquire a “competitive advantage” against big boxes. The panelists rolled their eyes and Lauren said that the question had already been answered, but I don’t remember the answer. Their response was that Home Depot and WalMart are pushing the project, so therefor it must be to their advantage rather than small business. A number of alternatives were offered from the proposed short sea shipping to lights on each end of the grove allowing the larger trucks sole use of the road for certain hours at night. We didn’t hear from any businesses in favor of the project, though Dr. Miller did address comment from Cypress Grove Cheese who say that the offloading adds over a dollar a pound for their high end cheese. Dr. Miller responded that the people in Marin County have enough money to pay the higher prices. Nobody addressed a recent occurrence involving the North Coast Coop in which a refrigerator was broken during an offloading incident. Of course, an accident like that could happen when unloading at the store itself. But it’s a story which has been circulating which will probably get some discussion in the future. When asked about the impact on Eureka traffic, Carol Dyer noted that there is an “STAA choke point” at the intersection of Broadway and 5th Streets, which begs a few questions about how the big boxes in Crescent City will benefit in the absence of some sort of Eureka bypass. But it wouldn’t be an issue for the Marina Center, nor any big box in Fortuna. And of course it wouldn’t have solved the Coop’s problem at either location. Would the trucks be sent down residential streets? The coastline? Concern for the roots of the trees was a consistent theme, as we all know that redwoods have shallow roots. Someone compared the roots to peoples’ toes or something, a point which was lost on me. There was skepticism about the promises of the technology being used. There was aesthetic objection to the proposed retaining wall. The owners of Singing Trees and Bigfoot chimed in not only in opposition to the project, but to what they described as the non-responsiveness of CalTrans in discussing mitigations which might help their businesses during any construction project. The primary theme however was to “preserve the buffer.” Right now the trees are preventing big boxes and over-development. They said that once the access is improved we “can never go back,” although if maintaining a physical buffer or interference is the goal, maybe we shouldn’t depend on the trees. Maybe we should just tear up the freeway and construct something like Lombard street coming down the Leggett grade. It would be safer. Apparently CalTrans has offered nothing in terms of an analysis of exposure to STAA truck accidents. Jeff Hedin argued the hypocrisy of spending so much money to prevent terrorism when our highways kill so many more people. I think it was Jeff who brought up the damage the trucks cause to the roads and asked rhetorically who would pay for it. And actually, I once read that commercial trucks in general, not necessarily just the larger trucks, cause something like 90 percent of the road wear and tear, but between taxes and fees they pay for less than 20 percent of the price – a reality typical of a country which socializes the costs and risks, but privatize the profits. Yes, we do subsidize the trucking industry. Perhaps it’s sound economic policy, but the free marketers are never around to protest the socialism. The photo comes from photobucket. The forum tonight was broadcast on KMUD and should be available in the archives. CSPAN will probably get its best ratings ever tomorrow as the “summit” starts at 7:00 a.m. our time. Here are the players and their anticipated strategies.